It the the custom in many Christian denominations to light a Pascal fire at their Easter rites. For Catholics, this is done after sunset on Saturday night. The fire is kindled outside the church and in many traditions a large candle and/or many candles are lit from the flames. Lighting the fire is often problematic, it should be visible to the people assembled, but confined to prevent hazards. It can be smoky. This weekend I became aware of an alternative to the traditional wood fire, replacing it with a rock salt and alcohol mixture. This sounds like a great idea. It is smoke free — you could do it inside — and that as these sets of directions suggest, you can add other salts to make beautiful colors in the flames. It is, in fact, a TERRIBLE idea. 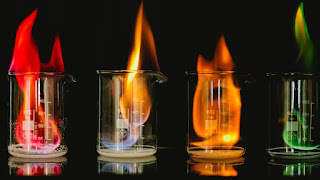 This is just a version of a chemistry demonstration, often called the rainbow demonstration, that is so dangerous it should not be done. Period. The rainbow demonstration has led to many serious burn injuries in onlookers and teachers, the Washington Post has an overview here. Under certain circumstances it can produce a flame jet. See this notice from the American Chemical Society, and this longer article about the hazards at the Journal of Chemical Education. link with instructions recognizes the vapors might escape, but doesn't seem to realize the hazard this presents. Some years back the American Chemical Society urged chemists to contact their local high school chemistry teachers about the rainbow demonstration to be sure the warnings reached them. It might be time to encourage chemists to reach out to their local churches to be sure they are aware as well. While writing a piece for Nature Chemistry about the hidden depths of the periodic table (the more than 3000 isotopes that could be stacked onto their elemental spots), I wandered across an interesting set of papers on heavy water and isotopic tracing, which led to another piece for Nature Chemistry (The weight of water). In one of the papers, future Nobelist George de Hevesy deuterates goldfish by crowding some twenty (albeit tiny) goldfish into 60 ml of water, in another he reports making thousands of distillations of urine to recapture the water, measure its density and track deuterium through the human body. Heavy water (D2O) is water where the hydrogens have been replaced with deuterium, an isotope of hydrogen that weighs about twice as much as standard hydrogen. Heavy water weighs just over 10% more than regular water, a tablespoon weighs only about a gram more, so it is probably not noticeable should you heft a glass of it. And that's the question — should you heft a glass of it? In small amounts it is certainly safe to drink, and as I recently learned, used in human metabolic studies in doses of about 10 ml. An interesting question raised in the papers I read was about the taste of heavy water. One report suggests a burning sensation might be felt when drinking it, another (by Harold Urey, who discovered deuterium) suggests it tastes like undeuterated water. But other reports say it tastes sweet. With a bit of help from my youngest son, I set up a repeat of Urey's blind taste test. And was surprised to find I could indeed taste the difference. It is sweet. And for the next few weeks, until the last of the extra deuterium clears my systems, I'll be just a little bit heavier than usual.